Steve Carell, who has previously stated that the upcoming season of "The Office" will be his last year, would like to surprise people with his exit. 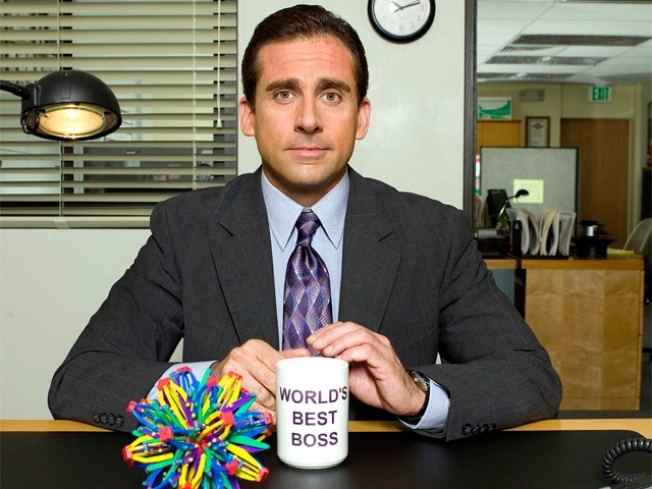 Steve Carell wants Michael Scott to leave "The Office" without a blaze of glory. "I don't think it should be made into a big deal," he told AccessHollywood.com's Laura Saltman of his "Office" character's departure at the junket for his latest film, "Despicable Me," on Saturday. "That's what I would favor." The star, who previously stated that the upcoming season will "probably" be his last year on the NBC show, added that he'd like to surprise people with his exit. "I always like when the show surprises people, because [a party] may be what you expect when he leaves," Steve said. "Maybe not tie everything up in a really pretty bow. I like that grey area of life." He added that the show, which has chronicled the lives of an awkward group of Dunder-Mifflin employees for six seasons, will go on. "The show is going to continue," Steve said. "It's such a great ensemble, there would be no reason to not continue." When told that many fans would like to see him ride off into the sunset with former flame Holly (Amy Ryan), he said the show may go a less romantic route. "I totally agree, but wouldn't it be great to disappoint the audience at large, and have you longing?" Steve joked. "'Wow, this guy's life is really not turning out well, and now we're not going to know what happens,' because you know what? That's art!" However, the star is hoping the animated "Despicable Me" is a crowd-pleaser – and said it's already a hit with his kids, with one caveat. "My son, afterward, he said, 'It was great, but why weren't you a minion? That would've been a really cool movie.' My 6-year-old is now my manager," Steve said, adding that the underlings of his main character, Gru, could potentially carry a sequel. "It depends how the movie does, but these little yellow guys are silly and funny and extremely lovable," he said. "Despicable Me" is due in theaters July 9. PLAY IT NOW: Is Steve Carell Leaving 'The Office'?